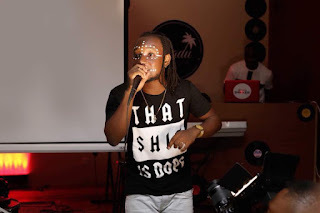 Ingenious Ghanaian Reggae/Dancehall & Afrobeats musician, Epixode, has successfully unveiled his 2nd studio album “3Nity” at a listening session with the media on Sunday, March 4 at Badu Lounge in Accra. The 21-tracked album is a combination of Reggae. Afrobeats & Dancehall, genres he says truly defines his originality as a musician. The album featured at least 10 artistes from Ghana, Jamaica, Zimbabwe, Nigeria, Cameroon et al. Notable among the featured artistes are Stonebwoy, Kurl Songx, Mix Master Garzy, Kwame from Ghana; Yung L from Nigeria, Mel B and Ammara Brown of Zimbabwe, Tneena from Cameroon and Junior X from Jamaica. DatBeatGod from Ghana, he says, produced about 80% of the songs on the album. Garzy also worked on the album. The award-winning singjay, Epixode further added that he will be embarking on a street promotion to get his music out his loyal fans. 3NITY will be in all online stores and digital platforms. The album is due to hit the online music stores in the last week of March 2018; specific date for releases on the respective stores will be communicated. Colleague Musicians Akwaboah, Deon Boakye, Frank Guy and a couple others came through to support the event. Epixode gifted colleague artistes and media personnel who came to support, plaques of his “3Nity” album.